Dunham has had a herd of deer for hundreds of years. The deer park is the only medieval park in Trafford to survive to the present day; the earliest record of Dunham's deer park dates from 1353. 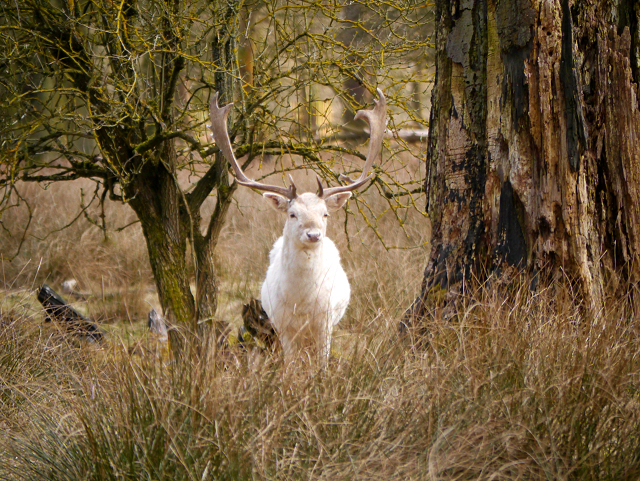 The present herd numbers approximately 150 fallow deer; this one stands out for obvious reasons! Dunham Massey Hall and garden are immediately west of the village of Dunham Town, with the deer park, the only medieval park in Trafford to survive to the present day, lying to the south of the hall. The present hall was initially built in 1616, but was later remodelled for George, Earl of Stamford and Warrington between 1732 and 1740; it was also altered towards the end of the eighteenth century and in the early twentieth century. During the First World War, the hall was used as a military hospital.